As we celebrate Valentines Day there couldn’t be a better time to talk about the importance of love and its relationship to happier ageing. There’s no denying it, healthy romantic relationships are most definitely good for the heart. But science confirms that healthy relationships in any form, from spouses to trusted associates, are the key to happiness and to living a healthier, longer, more fulfilling life. For most of us, we spend a good part of our “younger” and mid-life planning for older age. In particular we focus on financial security and our physical well being, thinking about our living and “care” arrangements framed in the context of how or if we will be able to physically and financially take care of ourselves.. Will we need someone to help us prepare meals? Will we need help bathing, shopping, driving? Will we be able to afford aged care? Can we access a home care package to help fund our aged care plan? All important questions and certainly an important part of any aged care plan, but what of our core happiness? Happier ageing doesn’t spring from having enough money, or being able to bath comfortably. It is a result of being surrounded by the people and purpose that makes each of us individually happy. According to George Vaillant, a Harvard psychiatrist who directed a 75 year study into happiness, the overwhelming result of the study was that happiness is built around two ‘pillars’: Firstly, love and secondly finding ways to ensure we don’t chase love away. The overriding finding which George Vaillant and his team put so simply: “good relationships are what keep us happier and healthier. Social connections with family, friends and community result in longer happier lives. OK, this isn’t new news. But that makes it even more puzzling as to why relationships aren’t a major factor in our aged care decisions. Often times we hear loved ones talk of the hope that placing an elderly relative in an aged care home will ensure they’re not lonely. The happiness study confirmed that in fact people are still lonely in a large group, and conversely can experience great happiness alone if they are secure in the knowledge that they have excellent relationships with people they can count on. When considering options for aged care why aren’t we considering the option that maintains our connections with community, our friendships and relationships? Why aren’t we placing the utmost importance on ageing in our own community, staying in touch with our social networks, surrounded by the connections we have spent years creating, nurturing, developing. At Nurse Next Door we focus on social connections, community engagement and building relationships. For some it may be as simple as a perfectly matched caregiver who becomes a close friend, for others there may be trips to community group activities, time spent online connecting with overseas friends and family via social media networks and for those with adventure in their bones, a trip overseas with a caregiver to provide companionship and assistance whilst travelling. Whatever is required, the caregivers at Nurse Next Door are trained to understand that maintaining connections does not happen without planning and effort. This was confirmed in the 75 year study which found that those who were happiest, were those that had actively worked to maintain or, where necessary, replace relationships such as work colleagues after retirement. Connecting with community is important however it’s not as simple as being surrounded lots of ‘friends’’. Unless relationships are meaningful they won’t result in happiness and in fact run the risk of increasing loneliness. As we age studies have shown that although our social network may decrease, this is often replaced with the fact that we have more time to spend socialising with friends and neighbours. Now imagine being removed from the very relationships we have spent years, possibly decades cultivating. Not just a marital partner but deep friendships from a variety of places – our children’s’ school community, sporting clubs we have been associated with and neighbours who have been there throughout our lives. In a study conducted by Kate Burke older couples listed Honesty, Communication, Companionship, Respect and a Positive Attitude as being necessary for relationship success. Furthermore, research has suggested that self acceptance increases with age and that with age, people have a stronger sense of their true self and less of a discrepancy between ‘real’ and ‘ideal’ selves.We also know that our identities are often heavily connected with our home and the community we live in. 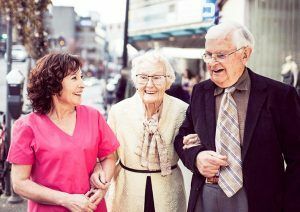 If the first two reasons aren’t compelling enough, the happiness study clearly showed that people in their 80’s, who have secure attached relationships, with people they know they can count on, have memories that stay sharper, longer! Matthew Lieberman, a distinguished social psychologist and neuroscientist, put it best: “Man is by nature a social animal”. Our brains are wired to form and belong in relationships and default to what Lieberman refers to as “social thinking” in our downtime. Anthropologists confirm this noting that most animals have a brain relative to their size – the elephant a large brain, the mouse a small one. Yet humans have a large brain compared to our bodies which has been shown to result from our primary need to socialise. The AARP’s Global Council on Brain Health presented data that showed having strong ties to friends and family and participating in meaningful social activities can positively affect brain function, making social connectedness a public health issue. Just exactly how social connectedness impacts the brain is still being researched however it is theorised that meaningful interactions with others helps protect the brain from the harmful impact of stress, due to the happiness experienced when surrounded by meaningful relationships. Other studies have found more concrete evidence of cognitive benefits, showing that engaging meaningfully in our community can reverse decline in our brain volume. Aged care that doesn’t consider, and more importantly seek to maintain a person’s relationships and their engagement in their own communities leaves them at risk of anxiety and stress. A study published in November 2018 found that one in four Australians report to be lonely with higher levels of social anxiety and depression and poorer psychological health. Not because they are physically alone but due to loneliness stemming from a lack of meaningful relationships.. 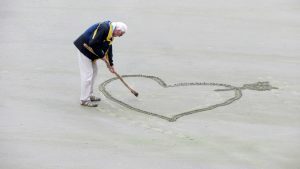 It may sound cynical or counter-intuitive to “plan” for love, but planning ahead to ensure connections and relationships with loved ones are maintained as we age is a sure way to know you’ll be surrounded by love well into older age. Ari Seth Cohen photographer and author of “Advanced Love” has produced a short film capturing the beautiful relationship shared between Mort and Ginny Linder. Is Ageing Possibly Mind Over Matter? Helping our ageing community rediscover their passions, hobbies, and joys while delivering care is what we love doing. Celebrate ageing with us! Get the latest news in home care, and access to exclusive tips on Happier Ageing.